December pretty much flew by and now that Christmas has come and gone, we’re getting some time to relax and enjoy ourselves. That means some fun things for us and Ellie. We’re almost at 32 weeks, which means 8 weeks left to go! My body is starting to be a little more achy, which is not awesome, but is part of the process and I don’t feel like I can complain too much. I’m definitely getting more hungry than ever before. I never really felt like I needed any more food than normal before, but now I am hungry all the time. We’re done reading our hypnobirthing book and we’re very excited to practice for a couple of months to prepare for labor. Brian has been reading the meditation and relaxation scripts to me, which is probably my favorite part of hypnobirthing. I enjoy listening to him a lot more than the affirmations on the CD. Ellie’s movements have been very frequent and strong. I’m pretty sure I felt her legs today with my hands, which is the first time I’ve been able to identify a part of her body. Last time we went to see Erin (our midwife), when we listened to her heartbeat we also heard hiccups, which was hilarious. Brian also heard them last night when he put his ear up to my stomach. Other doctor updates: I passed my glucose test, so I officially do not have gestational diabetes. My stomach is measuring right on par. We are now going to see Erin every two weeks instead of once a month. I do have slight anemia, so I’m taking Iron supplements. 1. Papaya Extract is phenomenal for heartburn! PHENOMENAL. 3. Amazon is really quite fantastic. With Amazon Mom, I’ve gotten several months of free Prime Shipping and it’s really been great – I recommend it to everyone! We put together the swing last weekend, which was a piece of cake. The nursery is pretty much ready to go, with a few little things still needed. We’re very excited to use our new gear and start putting the clothes on our little girl; as she gets closer to arrival, we are getting more anxious. We have a couple of fun weekends coming up. First, New Years, then another baby shower, then Brian’s birthday! I hope to have some more pics to post soon. 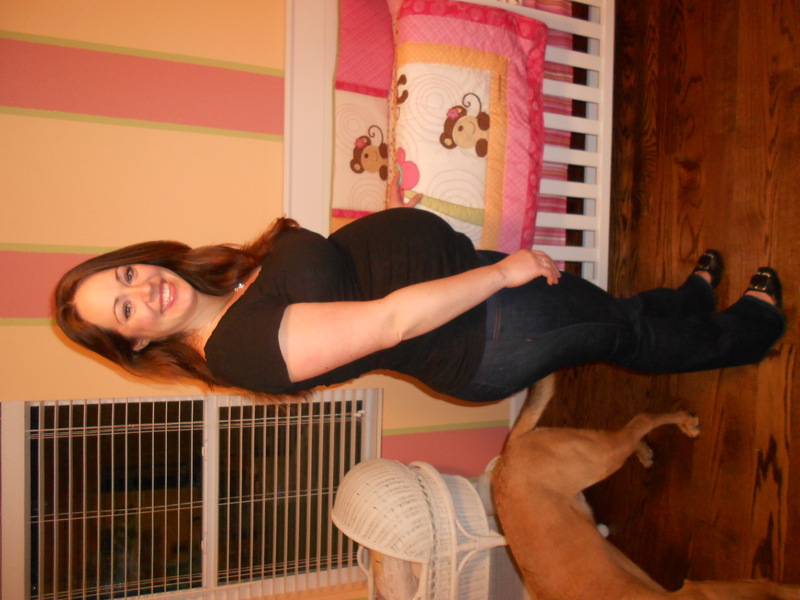 For now, here is a profile at 31 weeks in the nursery. Too cute! Can’t wait to meet her! Brian is showing Ellie picture books right, he can’t really read them can he? Way to start the new year off right, tons to celebrate and BAM your parents! Make sure to enjoy a few “let’s randomly go to the movies” now for you won’t get to until Ellie is old enough to go an by that time you will be going to see Cars part 5. Make sure the bolts are tight in the Crib and the Tire Pressure in the Bob is set to 28psi. Can’t wait to spoil that lil-nugget! I see Maxie is right in the middle of the action as usual. You look so healthy. Yoga has to be great for you and Ellie. Love you guys! Love the pics. Keep posting. Loving the updates. You look absolutely wonderful! Pregnancy obviously agrees with you. We all are looking forward to the big event. Have a super New Year, as you have so much to look forward to. Look out for Aunt Judy, as she is having grandchildren cravings & just loves babies. Love you!